Below are all of the questions we could remember having been asked in the past. If you have a question that's not on here, please feel free to email happyhour@alivenetwork.com or call Gemma on 0845 226 3116. Why should I book Happy Hour? The bands performance times are important in making your evening flow properly, and we are totally flexible with this, although we prefer that our performance doesn't happen at the same time as the buffet or anything else you may have planned at your event. We also recommend that our second set is timed so that we play for the last hour of the event, as the dynamic of the performance works really well in this format, and creates a finale effect at your party. Arrival 6pm to be set up and soundchecked by 7:30. Background/DJ music from 7:30 until 8:30. Live set 1 from 8:30 until 9:30. Live set 2 from 10:30 until 11:30 with encores or DJ music until midnight. 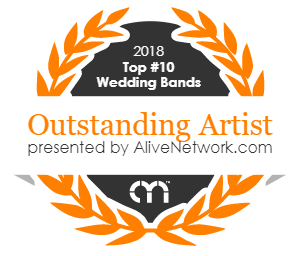 We are more than happy for you to pick which songs from our repertoire are played, but we do prefer to play a set we know works really well keeping a dance floor full all night. It is usually best if you let us know any songs you definitely DO or DON’T want rather than a hard and fast list that we feel obliged to not deviate from should the mood require it. This can be done in the pre-event check you will receive 3 weeks before your event from Richie. We are able to travel both UK wide and internationally. We are happy to consider learning your special song. It largely depends on whether the particular song fits our playing style and sound. It would be difficult for us to pull off a Frank Sinatra song, for example, due to our instrumentation. At the time of booking us, please let your agent know if there’s a particular song you’d like us to consider learning so we have enough time to learn it well. There is a studio recording of a live performance created to give you the opportunity to hear us playing totally live although its best to keep in mind that we were restrained at this shoot because of the way it was shot. Happy Hour are a high energy band and really let loose on stage! We carry a laptop with over 5000 songs to all our gigs that we use specifically for DJ'ing, making sure that we keep the dance floor swinging in between our live sets. We are happy to take requests for DJ songs. If you have some specific songs you want played you can let Richie know in the pre event check and he will make sure they are ready to go on the night. The DJ package upgrade option is offered for free if you confirm your booking with us within 7 days of receiving your official quote. You are welcome to use our PA system for your speeches. However, we don’t use radio mics in our live setup so, should you need them, you will have to hire them in advance. Google ‘radio mic hire’ for local suppliers. Makie DL 1608 digital mixing desk with built in effects like reverbs, gates, compressors, graphic eq's etc and independent in ear monitor mixes to ensure the best sound at your venue. We usually play two one hour sets. This can also be divided into three 40 minute sets, or 1x90 minute set if you prefer. We also offer an acoustic upgrade option which consists of 2 x 30 minutes of carefully selected acoustic music, perfect for during your meal or drinks reception. We are able to have 2 separate PA systems if your acoustic set is at an outdoor location free of charge. Just let us know in the pre-event check and we will bring the necessary equipment along. We arrive at 18:00 and usually start our first set at around 20:30, and play our second set in the final hour of the evening, but again we are totally flexible with this. Arrival and finish times are 17:00pm and midnight as standard with early arrival and late finish fees applicable outside of these timings. Assuming access to the venue is straight forward (i.e. ground floor room with no steps and vehicle access close to the venue), once all the equipment is loaded in we can normally be set up and sound checked in an hour. Like many professional party bands, our work is our livelihood and so we take our commitments very seriously. In the very unlikely event that the band had split up before your party, every effort would be made to find a suitable replacement band. We love it when people get up to sing a song with us, but we do like to make sure that those singing or playing with us have some experience of being on stage. We’re happy to arrange this with you in advance. However, past experience has taught us that welcoming impromptu guests onto the stage on the night itself, can often end in disaster so we’d rather steer clear of that situation! We always wear black shirts, tailored black jeans and matching shoes and ties. We always carry up to date PAT certification and have Public Liability Insurance cover up to £5M. We are without doubt one of the busiest and most experienced party bands in the UK. We have travelled all over the world, and played in every type of venue to all kinds of people, so we bring a wealth of experience to your event, not to mention equipment and live sound of the highest quality. It is important to us that we play something for everybody at your party. We understand that your event is special, and that you only get one chance to get it right. You are guaranteed 100% of our energy, enthusiasm and intergration with you and your guests. We love what we do! Prices vary slightly based on the time of year, the location of your event, timings, and any upgrade options, but our standard price starts at £1250. We don't charge for the time it takes for us to travel to the gig. We request a room in which to change, something to eat and drinks for the duration of our time at the venue. We have played in every type of venue, from festivals and football stadiums, from huge marquees and ballrooms to intimate clubs and private residencies. We always make sure that our volume levels are such that people at your event can still converse, but really feel as though they are at a gig when they're on the dance floor. Being a guitar based rock and pop function band, the nature of the music we play means that we can only turn down so far! If your chosen venue has a DB limiter, please discuss this with your agent at the time of your enquiry - There’s every chance that we (or one of our fellow agency bands) have performed at the venue before, but if not, it’s worth discussing to make sure that the performance you will receive from us will not be compromised. However, if your venues decibel limit is restrictively low, we are more than happy to provide an electric drum kit which we can turn down (unlike our acoustic kit) free of charge! We usually request 2 double 13 amp supplies near to the stage area. We use LED lighting which keeps our power consumption down but we prefer to run lights from one power source and audio equipment from another to reduce the risk of noise interfer-ence. As a rule, we draw approximately 16 amps with everything on and have only ever experienced any issues in events in marquees where the generator capacity has been too low.